I love yogurt. My daughter loves yogurt. I put yogurt in just about everything (see here, here, and here), so when we were at the bottom of the container the other day, and I was not feeling motivated to head to the store, I figured it was time to try making my own. I’ve seen the simple crock pot yogurt idea all over Pinterest, but also didn’t feel motivated to dig out the beastly thing from under the cabinet. 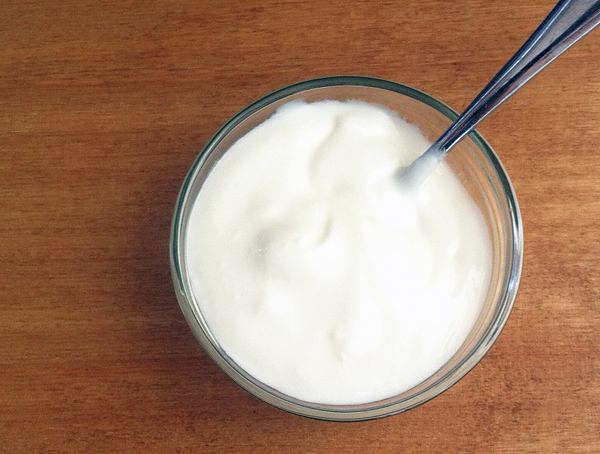 Making your own yogurt is so easy. In fact after you do it the first time you’re going to wonder why you haven’t been making it years. And you only need two ingredients. Here’s the deal. Making yogurt is basically heating up and cooling down milk and cultures to create the tangy goodness. You want things to be just right, otherwise you’ll have unhappy bacteria — which isn’t tasty for anyone. 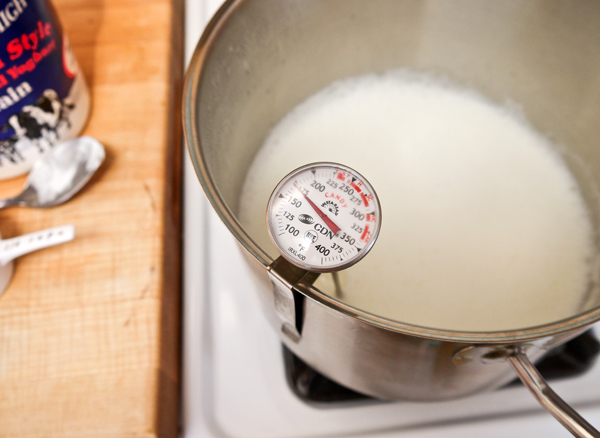 Start by heating the milk slowly in a large pot until it’s 180˚ F. We’re not talking a rolling boil, so give the milk a whisk every few minutes while it’s heating. Once your thermometer registers temp, turn off the heat. 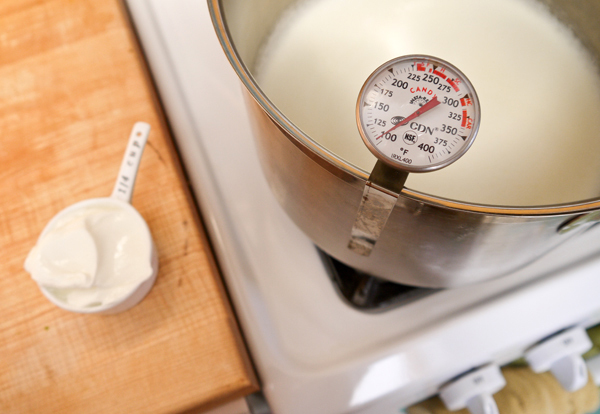 No let the milk cool down to 110˚ F and then stir in the yogurt. 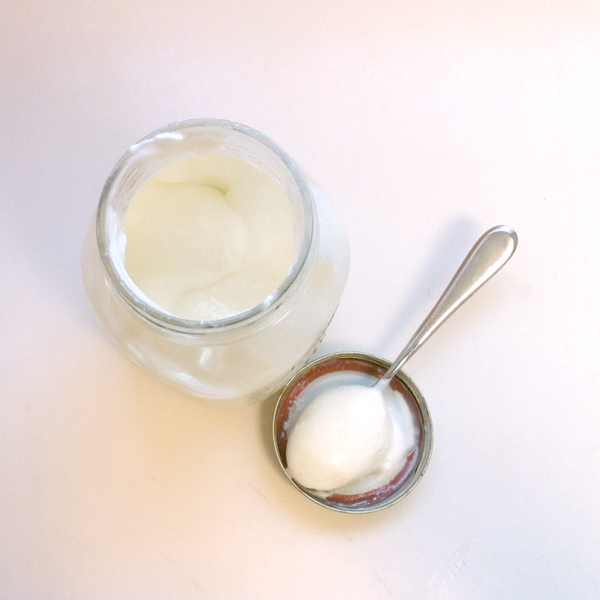 Any kind of plain yogurt works wonderfully, and you can continue using your homemade yogurt for making many, many fresh batches. Once the yogurt is incorporated carefully pour into a large container with a sealable lid. A big glass jar works wonderfully, just make sure to get it nice and sanitary before pouring the yogurt mix by filling with boiling water and then carefully pouring it out (it’s hot!). 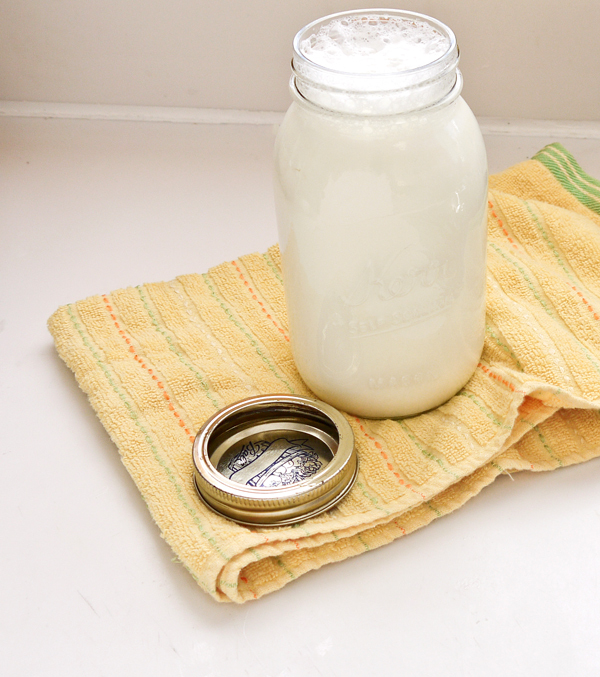 Cover the yogurt with a dish towel and let hang out in a warm spot for eight to nine hours. Seriously, waiting is the hardest part. I found a warm corner in my kitchen and had a difficult time being patient. I couldn’t believe the yogurt would come together just sitting there in a warm jar, but it did. And, wow. Was it good. I gave it a taste before popping in the fridge for several hours to really set up. The next morning the tot and I just about gobbled the entire container of homemade yogurt. Thick, creamy, and just a bit tangy, mix in a spoonful of jam, drizzle over some honey, or eat plain. If it doesn’t seem to work (still very thin) do you think it is a temp issue? I just put the jar in the cupboard and it is in the 70s right now. Could I leave it longer to fix it or not. Any help would be appreciated! It might be that it’s still too warm. If you’ve let it sit for over eight hours on the counter it might be a good idea to pop it in the fridge overnight and see if it sets up. Keep me posted! I use my cooler to keep the yogurt warm. Just put the jars in it and fill it up with tap water 110-120 F . Leave it overnight than move it to the fridge for few hours. Soooooo good! How much does it yield? For how many days will it stay good in the fridge? This recipe makes around 3 cups of yogurt and we ate it within a week. It’s really good! I usually make a whole gallon of milk with 1 cup of yogurt. It’s good for at least 2 weeks. Never had it longer than that to know 🙂 We eat a lot. For me the best way to make it is in the evening so it stays all night in the cooler filled with warm water (120F). In the morning I move it to the fridge for few hours and than eat.